Sherri Lynne Home Aluminum Pans are made out of Premium Quality Aluminum. Sherri Lynne Home Aluminum 8" x 8" square pans are a kitchen essential. The durable aluminum and unique design are made to facilitate air circulation to create an ideal cooking environment for even heat distribution and reducing the risk of uneven cooking or burning your food. Sherri Lynne Home Aluminum 8" x 8" square pans are disposable but durable enough to be washed and reused if necessary. Sherri Lynne Home Aluminum pans can be used to store, freeze, cook, and serve your food in one elegant container. Sherri Lynne Home Aluminum foil containers retain heat, and provide an excellent moisture and oxygen barrier to retain food freshness. Sherri Lynne Home Aluminum pans are eco-friendly and can be recycled. Sherri Lynne Home Aluminum foil pans, are manufactured with heavy-duty premium quality aluminum designed for strength, durability and convenience. Sherri Lynne Home Aluminum pans can be used to bake your favorite meals and recipes and can easily be frozen for those that enjoy meal prep in advance of holidays and parties or just preparing a week's worth of family meals in advance. The airtight lids allow you to easily take these pans along to the office, picnics, or sharing with friends and neighbors without worrying about spills or messes. 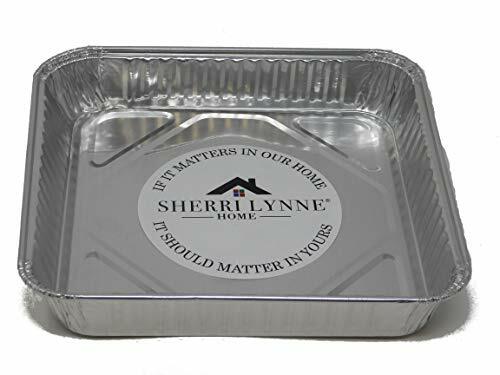 Sherri Lynne Home Aluminum pans are the ideal vessel Take-Out and Food Service, and are designed to work equally well for your favorite hot or cold food. Sherri Lynne Home is a leading manufacturer of distinguished disposable dining products for your home or business. Pans can be used to store, freeze, cook, bake in oven and serve your food in one elegant container. Thick foil containers retain heat, and provide an excellent moisture and oxygen barrier to retain food freshness. This pans are environmentally friendly and can be recycled. Made in USA! If you have any questions about this product by Sherri Lynne Home, contact us by completing and submitting the form below. If you are looking for a specif part number, please include it with your message. Libertyware - Stainless Steel Cake Pan with Cover - 9" X 13"